Cuts of the Cloth is a radical play about a sexism, Islamophobia, and ‘radical Islam’ — it examines a British Muslim woman’s place in the global War on Terror. The piece is a dystopian play à la 1984 and The Handmaid’s Tale, and sees a Muslim woman archived in a museum. She is literally objectified, the metaphor being that Muslim women, so often thought to be objectified by Muslim men, are actually objectified by Western ignorance, discourses, and rhetoric. Hafsah Aneela Bashir is the sole actor and also writer — the play looks at her character’s life as a mother, wife, and teacher, and how being Muslim affects everyday living: dealing, for example, with harassment by immigration officers, and fellow citizens’ ignorance and insensitivities. In this near-future, Muslims are sent to concentration camps, realignment programmes, or simply disappear. Bashir’s character is archived in ‘an exhibit for the people,’ where people can learn about the threat of Islamic fundamentalism. Every time she mentioned the realignment programme, she uttered “all hail for peace,” signalling indoctrination by Islamophobia. This is alarming given the current ‘re-education’ missions and concentration camps for Muslims in China. As a British Muslim, I resonated with these things — it was emotional seeing my reality performed on stage. The fact that 52% of British hate crimes are Islamophobic, but are rarely covered by the media, is evidence of why this play is needed. The piece also examined sexism; the #MeToo movement has seen lots of fiction looking at the sexualisation of women, but this play looked at racialised sexism, displaying how difficult it is to be both a woman and a minority. 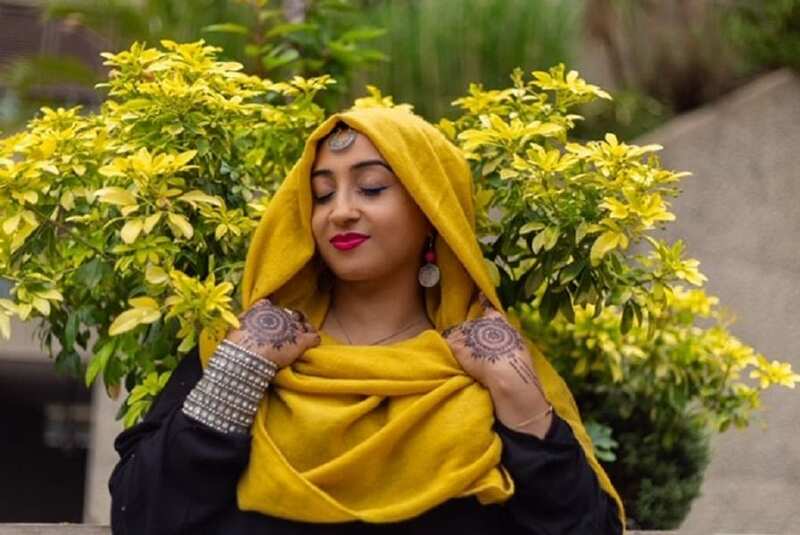 Bashir sung, danced, and took pride in her Islamic culture. Though objectified as a museum artefact, she refused to dismiss her identity. She channelled many emotions, from anger and frustration to disbelief and confusion. She showed this character at her happiest and also at her most grief-stricken. The set included two frames that Bashir stood between, signalling she was an artefact. The displayed personal belongings, including a shoe and toys, signalled that this is an ordinary woman who has had her life snatched from her; nothing more than a public attraction. There was a higher piece of set with a microphone, allowing Bashir to tower over everyone, and rise above the world’s horrors, a great directorial choice by Nikki Mailer. One of the final scenes saw Bashir stand above us and read the names of Muslim children and their horrid fates. There was a rally-like feel to it — it was both harrowing and cathartic. Whilst the content and characterisation were both top-notch, the execution needed some polishing. Whilst Bashir corrected her few small mistakes, she pulled a face when she forgot a line — that breaking out of character took away from an interesting moment: comparing sexism faced by Western and Muslim women. Kooj Chuhan’s videos on the screen at the back of the stage were very interesting. They included a woman describing the exhibit and discussing radical Islam. Whilst most contributed greatly to the piece, some were a little distracting; Bashir was captivating, and all eyes should have been on her. The positives, though, definitely outweighed the negatives. The play was didactic and educational but also touching and emotional. Cuts of the Cloth is an ambitious patchwork project — it just requires a little stitching and neatening-up. Politics and IR Student. I contribute to Opinion and Theatre. Follow me on social media: @jaydarcy7 (Instagram and Twitter) and theonlywayisjam (Snapchat).